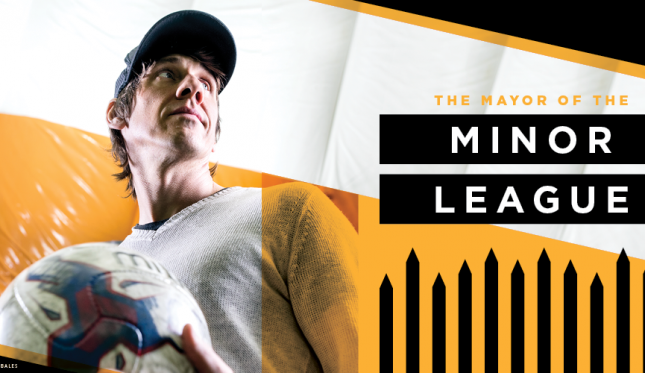 Foursquare cofounder Dennis Crowley has a dream: to build a profitable minor league soccer team in upstate New York. He just might transform American professional soccer in the process. Dennis Crowley is building “the most fun thing” he’s ever worked on. That’s a bold claim coming from the serial entrepreneur who sold one startup, the social networking software called Dodgeball, to Google and cofounded Foursquare, the local search and discovery service now valued at more than $300 million. Crowley makes this assertion while stuck in traffic, heading north on Route 9 in New Jersey. His shaggy hair tucked under a baseball cap, Crowley appears unfazed by the delay. The rapper Notorious B.I.G. blasts from the radio of his Range Rover, and Crowley happily nods along to the beat. 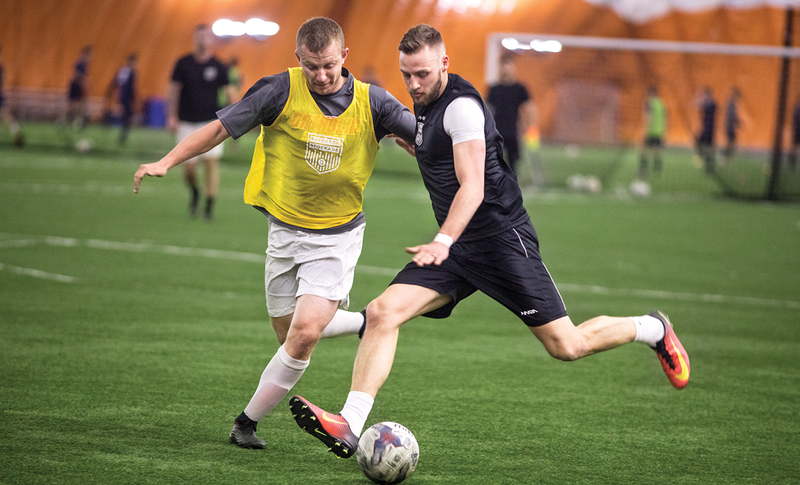 Ninety minutes later, Crowley stands on the sideline of a soccer field in a chilly aircraft-hangar-sized inflatable dome in Milton, N.Y. It’s early March, and he’s watching a tryout for Kingston Stockade FC, the soccer team he founded and owns. A mix of college athletes, guys a few years postgraduation desperate to extend their playing days and even some high school hopefuls ping the ball around the turf. Hampered by tryout jitters and unfamiliar teammates, the quality of play is, well, inconsistent. For every brilliant strike, there are multiple missed passes. Crowley, 40, doesn’t look all that different from his players. He sports a baggy V-neck sweater, brown pants and canvas shoes. He has a slightly goofy smile and boyish charm that softens a deep self-confidence. A year ago, Stockade FC existed only on paper and in Crowley’s imagination. Then an inaugural season saw the club draw an average of nearly 800 fans per game to Kingston, N.Y.’s Dietz Stadium. The number doesn’t sound like much, but it’s remarkable for the National Premier Soccer League (NPSL), a semipro league three divisions below Major League Soccer where most matches take place in front of merely dozens of people. It’s still the minor league, though. 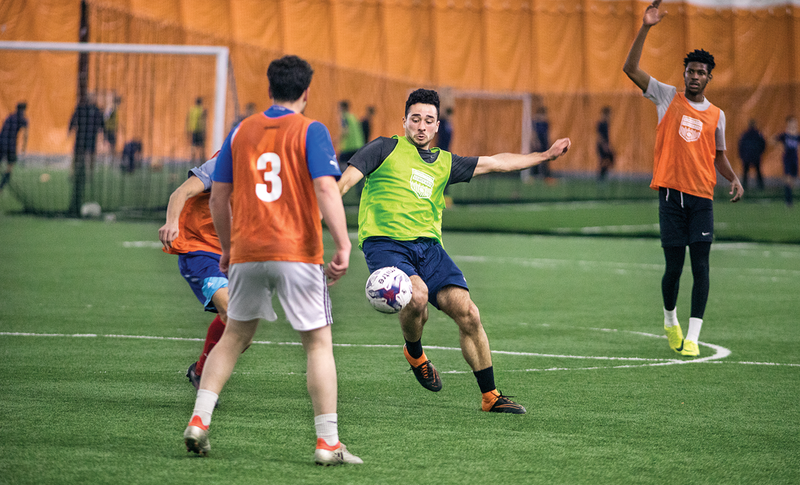 Stockade FC commandeered two fields for the tryout, uniting them to create a playing surface that resembles a full-sized field. Occasionally, a cross-field effort hits a guide wire that supports a curtain normally used to divide the spaces. But the players are undaunted and maneuver around the obstacles. And as Crowley looks out at this uneven assemblage of talent, he can see the future of his team—and, just maybe, U.S. soccer generally. In June 2015, Crowley was sitting in Angry Wade’s, a dive bar in the Boerum Hill neighborhood of Brooklyn, with some friends from the recreational soccer team he played with on weekends. Though he never played soccer in high school or in college at Syracuse, Crowley always had a passion for the game. While they were discussing the future of their squad and the lower divisions of American soccer, they began talking about starting a team of their own. For most people, the conversation would have ended there. But Crowley excels at building things. In the past, that meant tech companies, like Dodgeball, which he sold to Google in 2005 for an undisclosed amount, and Foursquare, which has 55 million active users. Crowley figured, why not build a soccer team as his next challenge? The Hudson Valley felt like a natural location. Crowley and his wife, Chelsa Crowley, a cosmetics entrepreneur, had just purchased a house in Kingston, about two hours north of Manhattan by car, and he was spending his weekends in the 24,000-person Ulster County city first settled by the Dutch in 1652. Crowley knew that Kingston had a growing community of young couples and families moving there from New York City. Ex-urbanite hipsters, he thought, were the type of people who would probably get behind a local soccer team. On August 15, 2015, Crowley submitted an application to the NPSL to create an expansion team. He thought the league’s bureaucracy would take a year or more to approve it. Instead, it took a month. 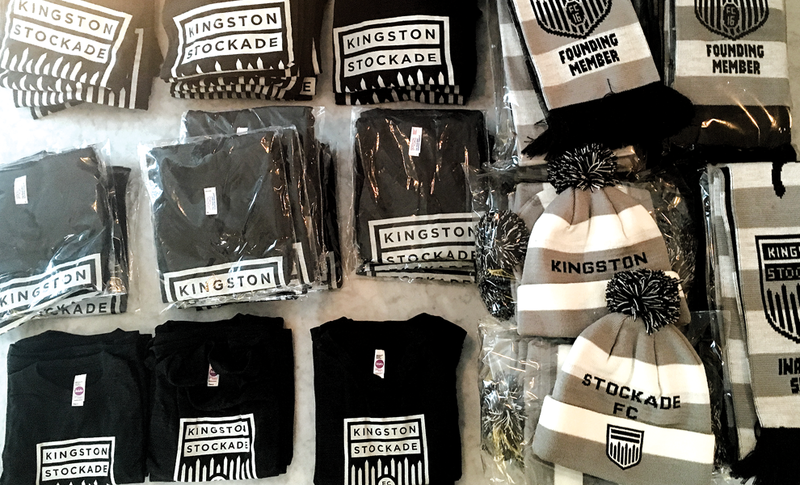 One $12,500 expansion fee later and Kingston Stockade FC—named for the fortification that protected the city’s settlers during the 17th century—was official. Now all Crowley needed was a coach, players, a field, insurance, sponsors, jerseys, balls, a dozen more things that he knew about and as many that he didn’t, before the season kicked off in May 2016. He hoped to do it all on an operating budget of just $50,000. One by one, Crowley checked items off his to-do list. He worked with Kingston’s mayor, Steve Noble, to secure the 1,500-capacity Dietz Stadium, owned by the city and the school district. It’s a venue that could be in Anytown, USA, with an eight-lane track ringing a football field painted in the maroon and gold of the Kingston High School Tigers. Crowley and general manager Randy Kim hired George Vizvary as head coach. A Hudson Valley soccer legend who led SUNY Ulster for 39 years, Vizvary enthusiastically pitched himself during a Stockade FC fan meet-up at a bar. In early February, Crowley and Kim launched an online store to sell jerseys and tickets. Later that month, they had their first of five tryouts. 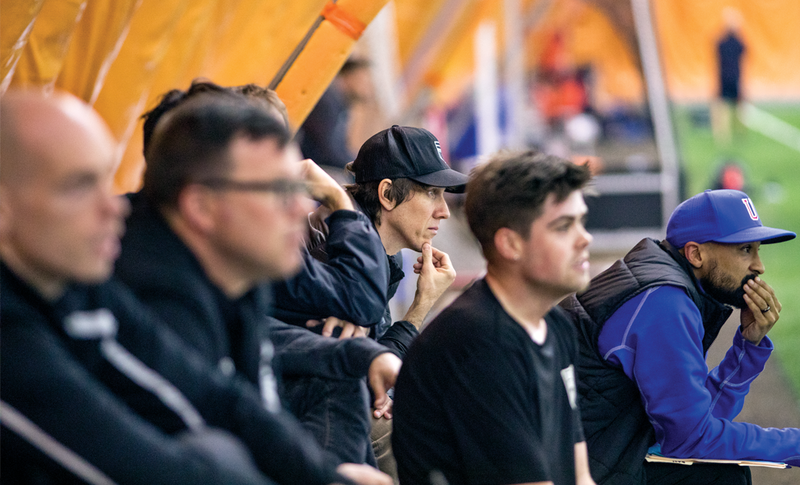 Finding players through Vizvary’s connections to local talent and the grassroots efforts of scouts Dan and Nick Hoffay, the team announced its 26-man roster in April. Meanwhile, Stockade FC secured sponsorships from local merchants including a bus company, a bakery and a radio station. Without a doubt, the team sparked some economic piggybacking. 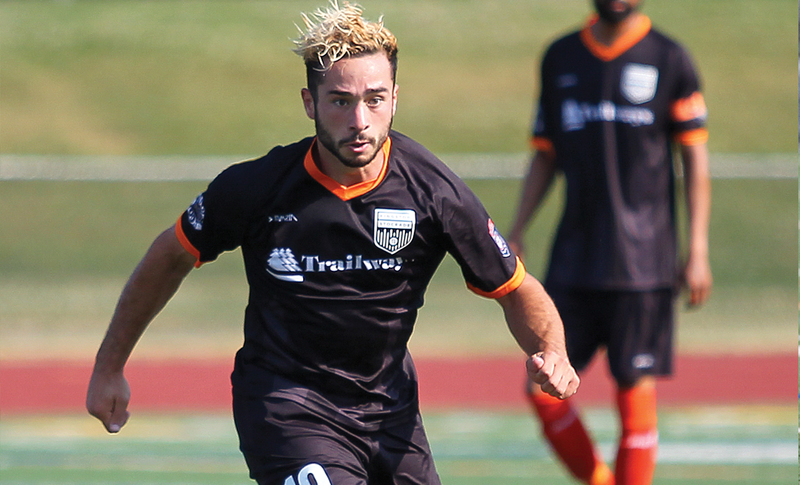 Stockade FC’s debut match was away on May 8, 2016, a 1–1 draw against Greater Lowell United, a three-year-old team from western Massachusetts. Two weeks later, Dietz Stadium hosted a weekend doubleheader. Paying from $5 to $8 a ticket, 830 fans attended Saturday’s 1–0 win; 851 saw Sunday’s 3–0 victory. Crowley had expected 300 attendees at most. Stockade FC drew an average of 755 fans for its eight home games, by far the highest in NPSL’s North American Conference, thanks to its sophisticated marketing and organization. “It felt like you were in a professional club without actually being in a professional club: the management, game prep, around 800 fans every home game with drums and chants,” Dylan Williams, a two-time All-American at Division III SUNY Oneonta, says via Skype from Tasmania, where he’s now playing for Launceston City FC. A sustainable NPSL may pave the way for a much bigger change in American soccer: the introduction of promotion and relegation. In most of the rest of the world, teams move up and down divisions based on their finish the previous year. For example, the bottom three finishers in England’s top league (English Premier League) start the following season in the second tier, the Championship, while the best three teams from the Championship replace them in the EPL. The numbers of teams and mechanisms for movement vary across countries and leagues, but the idea is the same: Promotion and relegation creates a Darwinian environment that ultimately promotes international excellence. In the United States, teams are fixed in a specific league with Major League Soccer at the top. The Chicago Fire won’t lose their spot in MLS, for example, despite finishing last in 2016, nor will the New York Cosmos move up after winning the second division North American Soccer League. It’s a situation that benefits MLS because it stabilizes the entry fees to buy into the league, and those fees have soared from an estimated $40 million in 2012 to more than $200 million apiece for the next four teams. MLS owners have invested too much in their teams to see them bumped down to minor league status. “I don’t think MLS wants anyone to threaten their business model, which is that expansion teams come in and they don’t come out,” Crowley says. A recent study by the consulting firm Deloitte found that creating a promotion and relegation system in the U.S. could benefit player development, increase interest in the sport and be a boon financially. Critics quickly pointed out that the study was commissioned by Riccardo Silva, the owner of NASL team Miami FC. Even the simple task of organizing the lower levels of soccer in the U.S. into fourth, fifth and sixth divisions involve a remarkable amount of work. Right now, there aren’t official designations or rules about what the fourth division is. 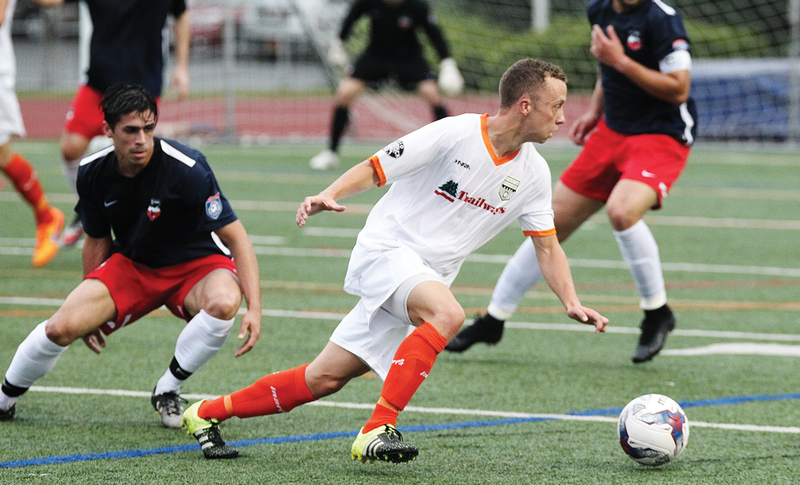 The NPSL considers itself the fourth division, but so does the Premier Development League. Other regional leagues can stake a claim as well. The day that a team like Stockade FC gets promoted after a strong season is certainly not close at hand. But the movement does seem to be gaining momentum, and much of it seems centered around Crowley. He cares, Crowley says, because each new minor league team, whether in Rockaway Beach or Kingston, improves the ecosystem of U.S. soccer. Maybe, someday, they’ll even help the nation win the World Cup. Contact mgmt@stockadefc.com or Jef Thiffault at jthiffault@npslsoccer.net.